Which food are called junk food? Do you take those food or not? I try to avoid those if I can. I think anything that is processed I would consider it junk food. Fresh Fruits & Vegetables are the way to go. Lollies, soft drink, potato chips, hot chips, ice cream, and hamburgers, hot dogs and other kinds of take away food are called junk food. Too much fat! Junk foods such as hamburgers, pizza, fried chicken and chips usually contain loads of saturated fats. Too much saturated fat in the diet will cause people to put on weight and get fat or obese (very fat). Being overweight is a risk to the health of the heart and can cause other diseases. Too much salt! Junk foods often have too much salt. There's a lot of salt already in foods such as bread, breakfast cereals and biscuits and cakes. So people are getting more salt than they need when they eat junk food. Too much salt is unhealthy for the heart. The photo has some foods in it that are good for you, tomatoes are an important part of a healthy diet. Cooked tomato is even healthier than raw which is unusual as most vegetables and fruit are better for you uncooked. If it is a pizza in the picture, eating pizza now and again will not harm you unless you are on a gluten-free or dairy free diet. 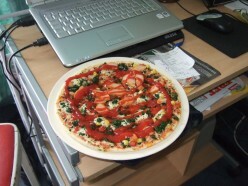 It is important not to live on fast food all the time and healthy meals are not difficult or time consuming to prepare. Some people think vegetarianism is a joke, but some statics show that vegetarians are less likey to suffer from some serious diseases. Salt is one of the things to take care that you do not consume too much of, as is sugar and these can be used in too higher quantities in some fast foods. To sum up if you like Fast food should be thought of as an occasional 'treat' (?) not a lifestyle. What are the drawbacks of junk foods? How can I learn to like healthy foods more than I do junk foods? How can I learn to like healthy foods more than I do junk foods?How can I get into the habit of eating healthy foods when junk food is so cheap and much more readily available? How can I learn to like healthy foods more than I like junk food? Is junk food okay in moderation? Is junk foods are good for health??? Should junk food be regulated?